Leader Accessories car seat cover renew your vehicle instantly. Easy installation (instructions included) compatible with side air bags and armrests optional reinforced foam padding provides added comfort if you need the arm rest holes, you can cut by yourself not sure about your fit? Check to ensure: your vehicle has detachable headrests your front seats are not attached to the mid console your front seats do not have integrated (attached to the seat itself) seat belts Leader Accessories vehicle auto seat covers are original designs for all types of consumers. We offer full protection from pets, dust, dirt and drinks. 1. Our universal seat covers fit most cars, trucks, suv’s and vans. 2. Wipe clean using mild detergent and water. Constructed from faux leather with 3 mm foam backing. 3. All seat covers have opening on the top to help you reinsert headrests easily. 4. Back of the front seat is made by durable stretchy material. Rear seat cover don’t cover the back side. 5. Backrest cover have 3 zippers. Accommodate left and right 40/60 split,60/40 split, 40/20/40 split and 50/50 split, an extra set of zippered cloth is included to cover the exposed rear bench area when split. 6. Rear seat cover allow the backrest middle armrest or the cup holder to come down by unzipping one of the zippers. 7. The back seat cover comes in two pieces, one that slips over the top unit of the back seat and you use the adjustable straps to keep it tight, then the other cover goes over the seat. WOULD IT FIT MY CAR?-Elastic side fabric and adjustable straps to ensure this seat cover fit almost all cars, suv’s, trucks and vans. Please make sure your headrests are detachable before purchasing this set. See details in following Compatibility Guide. PROTECTION AND DECORATION -Refresh your aged seats or protect your seats against spills, stains, fading, tearing, dirt, crumbs and pet hairs. ELEGANT SOULTION FOR YOUR CAR. MATERIALS AND CLEAN: Very Soft faux leather with 3mm foam padding, wear resistant, durable and deluxe. Easy to clean-Wipe clean and air dry. 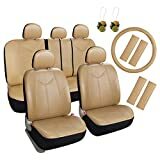 CONTAINS: 17 pieces Car Seat covers set includes 2 of front seat covers, 1 of rear backrest cover, 1 of rear seat cushion, 5 of headrest covers, 1 of universal fit steering wheel cover(14.5-15.5 inch), 4 of shoulder pads, 2 of air fresheners, 1 of cloth mesh. Leader Accessories vehicle car seat covers are original designs for all types of consumers. We offer full protection from pets, dust, dirt and drinks.
? Our universal car seat covers are easy to install, easy to clean and are airbag compatible. Fits most cars, trucks, SUV’s and vans.
? Due to installation requirement, please ensure your headrests can be detached before buying this set.
? Back of the front seat is made by durable stretchy material with opening pocket for storage.
? Bottom bench cover and backrest cover come separately, which is designed to accommodate infant/child car seat, allow you to fully utlize the belt or built-in anchors behind the lower backrest.
? Backrest and bottom covers both have 3 zippers. Accommodate left and right 40/60 spilt,60/40 spilt,40/20/40 spilt and 50/50 spilt, an extra set of zippered cloth is included to cover the exposed rear bench area when spilt. We are pleased to offer Free Returns on any eligible item within 30 days of receipt. You can learn more about how to return items here.
? Customer will be responsible for return shipping costs.
? When the merchandise has been used, it will not be eligible for return.
? In case of damage, defective or incorrect item, please contact us immediately for assistance . We will replace parts/products right away.